The excavation of the upper layers of Drakaina Cave deposits at the southern, sheltered part began in 1992 and was almost completed in 2002 (Fig. 1). Some balks and the western trenches Θ6, Ι4, Ι5 and Ι6 have not been excavated yet. The research has shown that the cave, which is situated within the area of the ancient city-state of Pronnoi, was used as a shrine during the historic period. The latter use is proven by remnants of hearths, abundant bones of ovicaprids and other domestic animals, utilitarian as well as fine ware of dedicational character, along with ceramic figurative dedications, such as protomes, relief decorated plaques and figurines. As indicated by the archaeological material, cultic use started at the end of the 7th century BC, and until the start of the 5th century BC it was very pronounced. Later, it seems that fewer people visited the sacred cave. From the late 4th century BC until the early 2nd century BC the shrine thrives again. 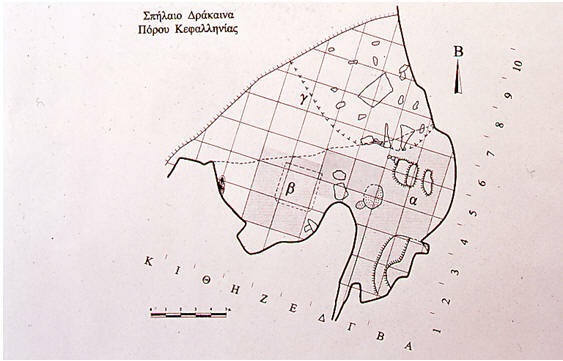 The abandonment of the shrine at the early 2nd century, if not attributed to other factors, such as an earthquake, might be related to the roman conquest of the island at 189/188 BC. This important rural shrine was dedicated to the nymphs, which is attested by two incised graffiti on Hellenistic pottery dated to the 3rd century BC. O n the neck of an amphora we can read text ΙΑΝΥΝΦΑΙΣ, in which case the last two letters of the lost word are very likely the end of the female dedicator’s name (Fig. 2). 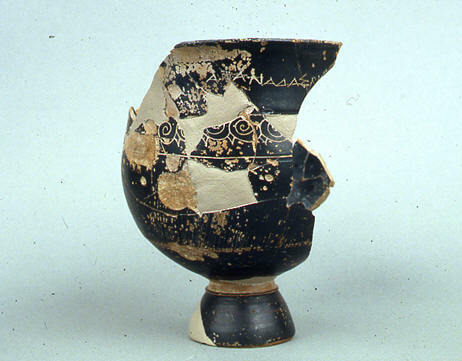 The opposite is the case with the second incised graffiti ΑΠΑΝΑΔΑΣΝ… on the rim of a black-glaze kantharos. 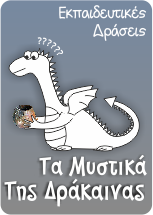 We have the entire name of the dedicator and the first letter of the second word, which is almost certainly ΝΥΝΦΑΙΣ (Fig. 3). At trench B6 a small circular bothros (diameter 0,40 m and depth of 0,30 m) was excavated, which yielded few animal bones and pottery dated to the 6th century BC. At trenches Δ4, Δ5, Γ4, Γ5 the remnants of two consecutive hearths were unearthed, which rendered along with ashes pushed aside, many sherds of drinking vessels and some pottery of different shape and use. 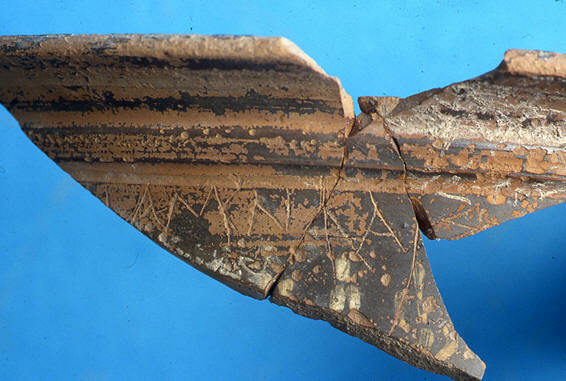 Many of the sherds have composed partial or entire vessels, which are seemingly the only that remained in situ after their use. Probably those vessels were used by the pilgrims during sacrificial feasts and deposited afterwards as dedications at the sheltered place by the rocky surface of the cave. At trench Ζ4 an area used for the refuse of feasting remnants around hearths was found. It is a square, shallow pit of 2,10 x 2,20 m. It was filled with soil, ash and some charcoal and contained a meager amount of pottery and many animal bones. Finally, the findings from two small refuse pits at the northernmost excavated area (trenches Β5/Β6 and Γ5) are attributed to the cleaning of the shrine during the Hellenistic period. The same holds for a large semi-circular refuse pit at the inner part of the cave (trenches Β2/Β3 and Γ2/Γ3), dug into the prehistoric layers. The most interesting aspect of the latter is that it has rendered almost the total of the ceramic figurative dedications of the shrine, since only 5 intact or almost intact and few small fragments were found in the rest of the excavated deposits. 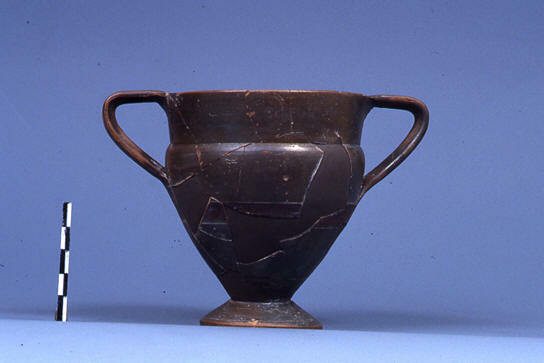 The fine-ware from the cave is of interest, both because of the multitude of shapes and its provenance from Corinth, Attica, Elis and possibly other places, which testifies to the intense contacts of Kephallenia with the major pottery centres. 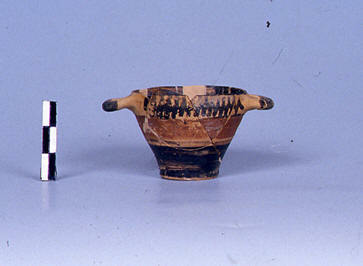 Predominant shapes are drinking vessels, namely skyphoi (Fig. 4), kantharoi (Fig. 5), kotylai and kylixes, whereas plates, pyxides and vessels of liquid offerings, such as oinochoai, lekythoi, amphoriskoi etc. are represented by far fewer specimens. It has to be noted that decorated Corinthian and Attic ware is limited. 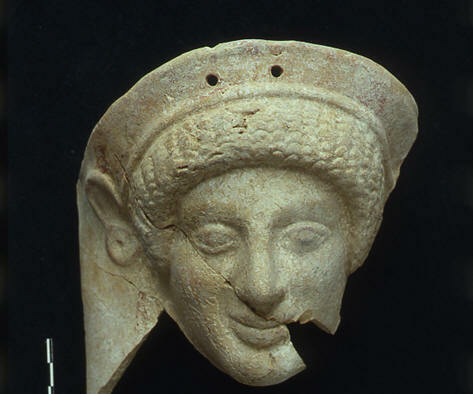 From the sherds found very few vessels were restored, such as a Corinthian kotyle with a depiction of Sphinxes, dated to the late 6th century BC. In addition, three incense-burners and very few sherds of lamps were found. Finally, the shrine yielded a considerable amount of coarse-ware, namely sherds of amphorai, lopades and cooking vessels. 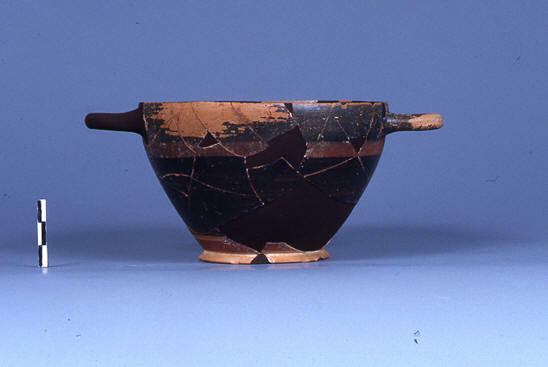 The pottery from the cave was use either as cultic objects, or as drinking vessels and food processing and consumption during feasting episodes. Many of them, mostly those of finer quality, and certainly those bearing dedicatory graffiti to the nymphs, were dedicated after their use or at the first place to the deities of the cave. Finally, of dedicational nature were micrographic vessels, empty or full with some liquid, many of which are Corinthian. Among them kotyliskai (Fig. 6) and small skyphoi predominate, while small bowls, krateriskoi and several other shapes are represented in much smaller numbers. 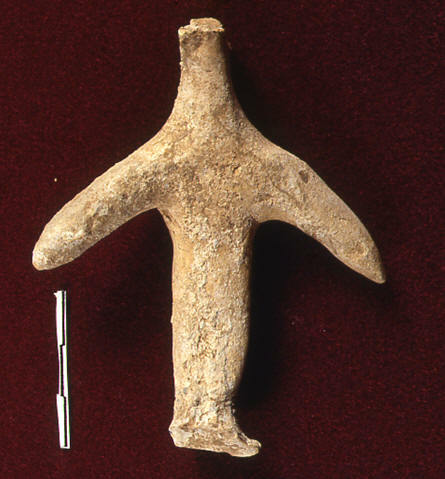 Except for four hand-made figurines, three of which are bird-shaped and might be part of sacred circular dances (Fig. 7), the rest of the figurative dedications are mould made. Most of them are of very probable local mass production, with foreign, mostly Corinthian influences. Masculine depictions are limited to two relief plaques which depict the same senior figure, a partial figurine of god Pan playing syrinx, and a partial figurine of the type depicting naked young boys, sitting on the ground . On the contrary, there is a profusion of female ceramic images. The larger part of them depicts protomes with low open wreath or cylindrical polos cap on the head. Exceptional for its quality and the good preservation status is a late archaic protom with wreath and peplos, on which residues of the original colors can be discerned (Fig. 8). In comparison to the protomes the figurines are very limited in number. Besides five sitting ones (the three of them of the well known Corinthian type of enthroned with polos cap and dove deity (Fig. 9), all the rest are standing and belong almost to their entirety to complexes of circular dances of four feminine figures around that of aulete. Four types can be discerned. 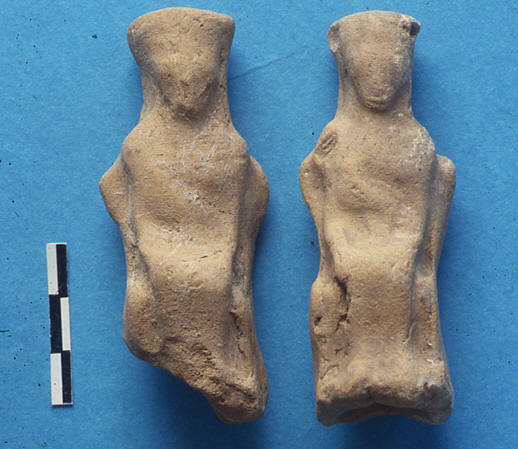 Plank-like female figures, which retain part of the original coloring, dated to the 6th century BC. 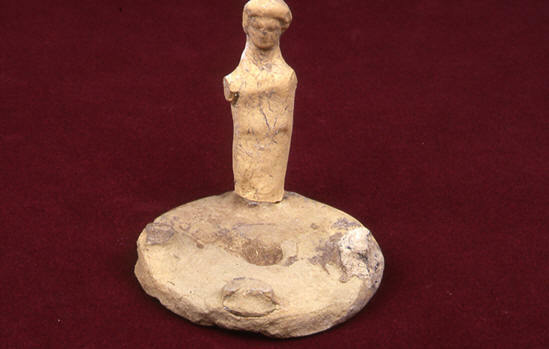 Peplophoroi dated to the 5th century BC (Fig. 10). Two Hellenistic types of the late 4th or 3rd century BC, from which we show the one with female dancers who wear a folded khiton fasten high, below the breast. A circular female dance is depicted on a relief disk dated to the late 4th century, of which only a small fragment was found, namely two partial female figures. Besides the findings related to the nymphs, such as the figurine of Pan, the circular dances and mainly the graffiti, we have to remark the relief plaques depicting a senior male figure. Albeit it is not possible to be corroborated on the basis of the available archaeological material, we believe that they depict the Zeus Ainesios, the sky god venerated by all ancient Kephallenians on the summit of mount Ainos.